“It always seems impossible until its done.” — Nelson Mandela. Challenging hikes give way to pristine snow-peaked mountains, crystal clear glacial waters, and unfazed wildlife in this beautiful national park. Grand Teton is home to a picturesque range of peaks, including its namesake, the Grand Teton peak. Best clubbed with a trip to the Yellow Stone National Park, your $50 park pass covers both national parks and is valid for 7 whole days. 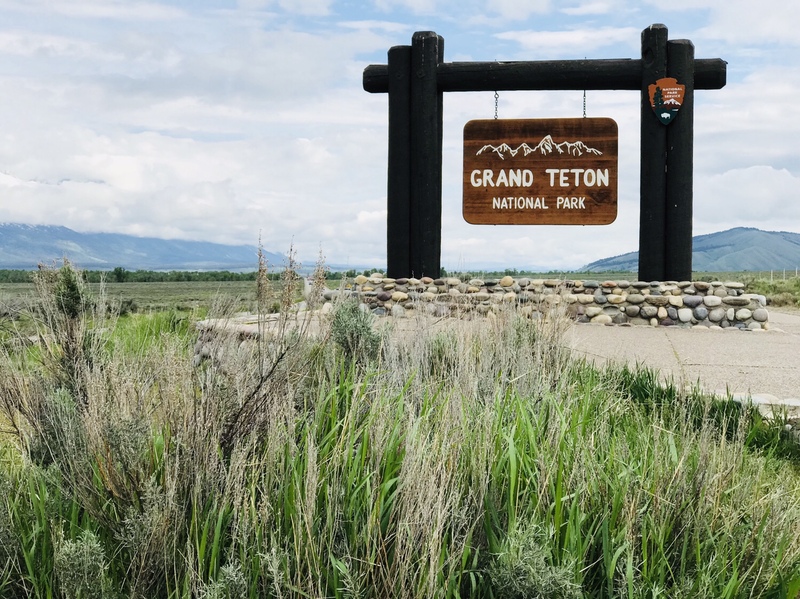 While the Yellowstone National Park mostly involves driving from one highlight to the next, Grand Teton is best seen on hikes and trails on foot/ cycles/ horse-back! If there was only one trail you could do at the Grand Teton National Park, my vote would be to hike the Jenny Lake Loop Trail. Now by no means is my family what you call overly ‘outdoorsy’. Sure we enjoy the occasional walk around the block, a friendly game of badminton, or a night-in playing Pictionary, but a 8 mile hike with a steep icy elevation was not something we had trained for, leave alone wanted to attempt on a relaxing holiday. Introducing your family to the great American outdoors, begins with deception tactics — “Of course it’s an ‘easy’ hike and it will be super fun you guys.” On the sly you carry ample snacks and water – you know ‘just in case’. What starts off as a flat walk into the woods shortly reveals pristine views of the Tetons and a serene Jenny lake. Between glacial waters and the clouds, the Teton Peaks play hike and seek. The closer you think you are, the further away they seem. You look for traces of the hiking path along rocky icy peaks. And just as in life, the path is not entirely clear. But you keep walking anyway. An hour and a half in, you are breathless. The steep climb knocks the wind out of you. You have already lost most of the initial excitement of going on a hike. All you can see is an endless trail and the lake peeking in and out. You all fall behind, in turns. You hope that everyone is as tired as you are, needs to take a breath, a sip of water, another bite of the apple. Your muscles scream out in wonder; why are they being worked so hard on a holiday! The heart detests pumping harder than it already is. Are we there yet? Don’t know if we should laugh or cry. All until you reach the clearing. Here is where you see Jenny Lake in its entire glory. What?? Are we only a quarter way there? The fleeting joy of spectacular lake views suddenly take flight from faces. All variations of – “lets actually go back the same way now”, “the whole point was to see the lake right?”, “i think this trail is impossible to complete”, “i actually don’t see anyone else on this trail, maybe we have to return from here” are vocalized. But we had reached that point in the hike where it was too late to turn back but impossible to move forward. And everyone knew it. Just further ahead, did we get tempted to jump on a ranger operated boat that would take us back to the starting point across the lake by throwing $25 (a pop) at the exhaustion? — Yes, Of course we did! But thanks to dad’s determination to keep the family honest and on track; he slyly disappeared far ahead into the woods beyond the Boat pick-up point, forcing us to go looking for him. After which we forgot all about the boat. So we were like father like daughter after all! Interesting how fickle yet determined your mind can be; all in split seconds. Momentary temptations stray you from goals. Just like in life. Despite numerous apprehensions and doubts, in life, we chug along anyway. So why should a hike be any different? And so we kept on moving. Luckily, hidden Falls, restless rapids, bubbly ripples, serene streams, and bright yellow flowers kept us company on our seemingly endless journey. Also knowing that the only option left now was to move forward helped slightly. Many pit-stops, songs, games, talks, break-downs, pump-ups, tears, and laughter later – we finally completed the loop! And the views were breathtaking to say the least. We made the entire Jenny Lake loop! So i guess, we all do in fact underestimate our abilities to just keep moving forward despite all odds. And that it always seems impossible until it’s done! Both on hikes and in life alike. Happy Birthday Mom! 🙂 We are so proud of you! If there is one thing you want to take away from this post, it should be that, the next time you feel tempted to give up mid-way after setting out on a new journey, think of our seemingly “impossible” Jenny Lake hike and how we completed it just fine. And the great fondness with which we remember the journey itself. Of course, endless nacho bowls, mahi-mahi tacos, and bottom-less margaritas back in Jackson Hole made up for all else. Check out my previous blog on Yellowstone National Park and the one coming up on Bryce Canyon National Park! Previous Living on a private Island – What’s it like? Pingback: Bryce Canyon National Park – 9 of 59 – Life on a post-it!